"Of course. Who would need a castle without a ghost!" "The Terror of The Werewolf Castle Part One: Germany"
And so it begins. I've mentioned often that I prefer short detective stories over longer stories here. It might have something do to with my inability to focus on one single thing for a long time, it might have to do with my love for tricks (and short stories == more tricks in the same amount of pages). Whatever the cause, I usually have to plan when I read a long novel. And I had been postponing it for some time now. But now I've finally started reading it. So there's no turning back now. I've started in The World's Longest Detective Story (@ time of publishing). 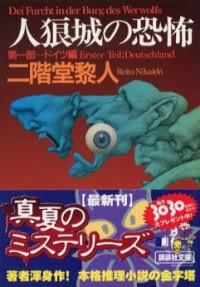 Nikaidou Reito's Jinroujou no Kyoufu ("The Terror of The Werewolf Castle") is a monument in Japanese detective writing. The story was published from 1996 until 1998, divided in four separate books (Germany, France, Detective and Conclusion), around 700 pages each. So it's long. It's really, really long. To compare: most Japanese detective novels I have are around 300-400 pages, with some exceptions that reach into the 600s. Jinroujou no Kyoufu is no push-over and certainly something you have to prepare for. Well, at least if you usually read short stories. So what's it about? I'm not totally sure at the moment, as the story is split in several parts. The main problem in the story is the so-called Werewolf Castle. In fact, the Werewolf Castle is a collective name for two identical twin castles, one called the Silver Wolf Castle, the other the Blue Wolf Castle. The two castles face each other, with not only a deep gorge seperating the two, but also the German-French border. The Silver Wolf Castle is on German territory, the Blue Wolf Castle on French. Twin castles are a rare thing as is, and thus many myths are connected to the castles. It was even thought for a long time that the twin castles didn't exist at all. But they do. And they are the stage for a truly horrifying story. In the first part, Germany (or as the cover says: Dei (sic) Furcht in der Burg des Werwolfs Erster Teil: Deutschland), a group of people are invited by the current castle lord to spend some days at the Silver Wolf Castle. The group is a varied one, with aristocrats, university professors, musicians and actresses amongst the visitors. The stay at the castle seems fun at first, the party being welcomed warmly by the lady of the castle (the lord had been called away on business) and her servants, but the fun quickly turns into horror when they get locked up in the castle and people die one after another. The first death seems like an unlucky accident, but the second incident, where an husband and wife are found decapitated in a locked room, leaves little doubt; someone, or something is killing them all. Add in a bit of poisoning and a crossbow shooting shadow. But who is the murderer? Is it someone from the party? Or one of the inhabitants of the castle? Or maybe a ghost? Or the Devil himself? For who else but the devil could have made a suit of armor kill somebody in a locked room and then disappear again into thin air? As fewer and fewer people are left, they start to suspect each other, but that is still not the end to the terror of Werewolf Castle. Because this was only part one. Which was long. Very long. But a lot happened. It's even a bit information overload. It starts with a retelling of the Pied Piper of Hamelin, makes a detour to werewolf legends and the Spear of Longinus, adds in the complicated political situation of Werewolf Castle (being in both Germany and France) and the creepy Silver Wolf Castle with hidden passages and suit of armors on every floor, and I think Nikaidou might also work out the World War II / Nazi regime point a bit. Oh, and there's the 'main' story too. So yeah, a lot to keep track of. But I enjoyed the book quite a bit. The locked rooms presented are very interesting and while I complain somewhat about all the themes in the book; I do like them and I'm curous how it'll work out in the end. I only have a problem with the names. Readers of Japanese will understand me, but reading a book with names only in the katakana script is very, very hard on the eyes. And while I usually can imagine what the name is supposed to be in English when written in katakana, I often have no idea with German names written in katakana (yes, German names are quite different from Dutch). Funnily enough, a lot of Japanese reviewers comment on how hard it is to remember all those foreign names. But everything up until now was only part one. Of four. I'm not even halfway in the story. This is just the very beginning of the story. So there is no solution or anything to the murders here. Just the main problem. I'm not even sure whether I already have all the clues necessary to solve the case. Suffice to say, I haven't any clue at this stage. The second part, France, is probably set in the Blue Wolf Castle in France. It seems that the detective, Nikaidou Ranko is slated for an appearance in the third book and only solves the gigantic case in the last book. So I have still a long way to go. Well, no matter how old this post is, the katakana problem will always stay alive :P With English names it's usually not very difficult to figure out what the names are (I'm reading a Holmes pastiche now in Japanese), but when it's really frustrating when they use katakana for either languages I'm not familiar with, or for languages with sounds that can't be rendered in katakana in the first place (the Dutch "g" for example). would you say that the solution was satisfying and complex enough to warrant a whole book for the explanation? The last volume definitely has some padding going on to bring it to the 600~700 page count (Nikaidou loves lengthy writing), but on the whole, the explanation to all the events definitely needs a hefty amount of pages, as it has to address the individual murders that happen in both castles, and then also explain how the murders in both castles relate to each other. Miyuki Miyabe's The Puppet Master is also quite lengthy and now available in translation as an e-book (or at least part of it), so that might be an option, but yeah, the length of this story is definitely a hurdle which is difficult to conquer, as it asks for a lot of devotion by all the parties involved. thank you for the answer. you're a sweetheart as always. the puppet master seems intriguing and i will google it to make a purchase. are you hard at work on some localization goodies? please say yes because i exhausted your previous translations and am famished for more. There's something in the works yes, but I can't give any details about that yet (also because I am not exactly clear on them myself). I'll definitely announce it on the blog when it has taken a clear form. Writing about (mostly Japanese) detective fiction. Author of the introduction to EDOGAWA Rampo's The Fiend With Twenty Faces. Translator of AYATSUJI Yukito's The Decagon House Murders, ARISUGAWA Alice's The Moai Island Puzzle, ŌSAKA Keikichi's The Ginza Ghost, ABIKO Takemaru's The 8 Mansion Murders and more.